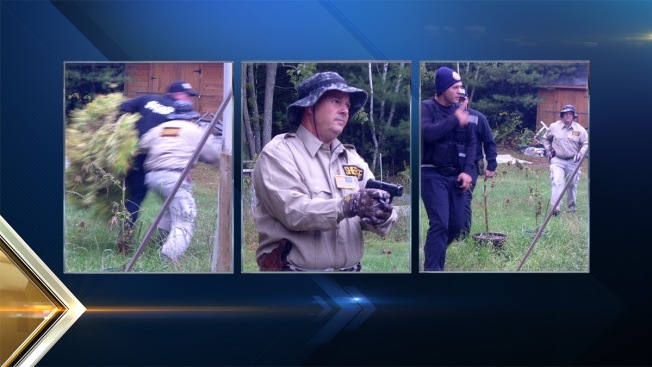 Maine State Police have issued arrest warrants for two of the three men they say impersonated law enforcement officers and robbed a medical marijuana growing operation. Police have identified the two as Jeffrey Hurd, 47, and Scott Roberts, 35, both of Glenburn. Hurd, who troopers said was wielding a handgun during the robbery in Winterport, is 5’6” tall. Roberts is 5’11”. Three medical marijuana growing operations in Maine have been targeted by thieves in the last two weeks, leaving one grower hospitalized with injuries. The crime spree is now raising questions about the security around grow sites and the safety of the people who farm them. Catherine Lewis and her husband Glenn are two of the roughly 1500 licensed medical marijuana growers in Maine. They say the recent crimes against growers in Winterport, Standish and Lewiston have made them nervous. In Standish, a grower was hospitalized after police say two men, Clyde Humiston of Portland and Justin Vadas of Gray, attacked him and sprayed him with pepper spray in an attempt to steal his plants. Police say the crimes point to Maine's substance abuse problem and the fact that there's a market for high quality marijuana. Anyone with information on Hurd or Roberts should contact police.